Named after its home, New York, the Empire State, the 102-story Art Deco Empire State Building landmark is an enduring symbol of New York, of America, and of human achievement. Like the Eiffel Tower in Paris, or the Tower Bridge in London, a single image of the Empire State Building instantly calls to mind all the life, possibility, and excitement that the city has to offer. The Empire State Building's main attraction, the observation deck, is located on the 86th floor. Because the Empire State Building is again the tallest in New York, it offers unobstructed 360 degree views of a city that has inspired countless painters, photographers, playwrights, novelists, and filmmakers over the years. 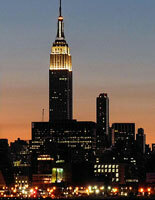 The Empire State Building itself has also inspired over 110 million people to sample its unrivaled views. The 86th-floor observation deck offers a climate-controlled glass-enclosed viewing deck which is surrounded on all four sides by an open air viewing deck which offers viewers high-powered binoculars for better views of specific New York landmarks. Express elevators offer everyone, including the handicapped, easy access to the Empire State Building's 86th-floor observation deck. The Empire State Building boasts a second observation deck on the 102nd floor, which was closed in 1999, but reopened in 2005. It is enclosed and smaller than the Empire State Building's 86th floor observation deck. It may also be subject to closure on high traffic days. On the Empire State Building's second floor is a simulated aerial tour of the city called the New York Skyride, which lasts about 25 minutes. Its tone has changed somewhat since September 11th, 2001, but visitors still describe it as inspiring. It's easy to forget that the Empire State Building is still a working office building, not just a tourist attraction, and boasts high profile tenants such as Alitalia, the Croatian National Tourist Board, Human Rights Watch, and the Polish Cultural Institute in New York. A cultural institution in its own right, the Empire State Building has a featured role in many artistic landmarks, including the films "An Affair to Remember" and "Sleepless in Seattle." Both films, although made almost forty years apart, feature climactic scenes at the New York landmark. That speaks to the enduring cultural legacy of the Empire State Building. The Empire State Building also offers a myriad and ever changing choice of restaurants, bars, coffee shops, and convenience stores to satisfy the visitor's every desire, need, or demand. The Empire State Building is located at 350 Fifth Avenue, New York, NY 10118, between 33rd and 34th Streets. It has its own website at www.esbnyc.com. Check online before visiting, because while the observation deck is typically open 365 day a year, it can be subject to temporary closures for maintenance.